Since graduating from the ISU, I have been home with family, in Toronto for the IAC, to St. Catharines to visit my sister and her friends, back home for Thanksgiving, back to Toronto for a few weeks to visit friends, and finally back home. It has been a busy time, and I have been working hard to make the most of it. I am very glad that I am adaptable, flexible, easy-going, and other synonyms for not minding change so much. With being all over the place, and especially changing places and occupations from "student in Europe" to "young graduate at home in rural Canada", an inflexible attitude would have made everything very difficult. However, I have smiled, rolled up my sleeves, and faced new challenges and tasks with enthusiasm. With the holidays coming up, there's the usual stress and excitement which comes with dealing with snow, super-cleaning the house, decorations, and the possibility of gifts. In some households, especially on TV, the holidays are accompanied by friction between family members. While I have seen a fair share of this friction, nothing compares to what I have seen this year. The situation is so bad that I'm wondering if it will be a very quiet Christmas at my home. In honour of its test flight tomorrow, today we take a look at the Orion spacecraft and what its development and test flight will mean for human space exploration. Welcome back, space fans! Today's post is about the 2014 International Astronautical Congress (IAC) which I had the privilege to attend! The 65th of its kind, the IAC is an annual event bringing together space enthusiasts and professionals from all around the world. I had an incredible week and here is a synopsis of what followed. Welcome back to Embrace Space! This is a very special post covering my graduation from the ISU and receiving my Master of Sciences diploma. Leading up to that, I will reflect a little on my time there and the difference 1 year has made. Wrapping this up on my trip to Paris, this post takes you through the last two days I spent there. Hello! Continuing our trip around Paris, France, Juliette and I had scheduled to see the Saint Sulpice church and Notre Dame cathedral. As mentioned last time, Juliette had been promising a surprise event all week, and that event turned out to be a Star Wars exhibit! Welcome! In this post, we are going to explore a Marvel Museum, the Parisian Museum of Natural History, and a centre for modern and contemporary art! My week in Paris: Day 3, Le Musée du Louvre! As promised, day three was all about the Louvre! So, let's take a look at one of the world's most famous museums! My week in Paris: Day 2, the Day of the Dead! Hello again! For our second day in Paris, Juliette and I explored the Père Lachaise Cemetery and the Catacombs of Paris! Calling it the day of the dead, it was a day full of exploration, solemn respect, and interesting visuals. So come along! Bonjour! Comment ça va? Right after finishing my internship at the Johnson Space Center, I flew directly back to France to spend a week in Paris! While I had lived in France for 8 months previously, all I had seen of Paris was the airport and train station. So, over the course of a few posts, I will share my adventure! Today is my last day in Houston, Texas, wrapping up my internship at the Johnson Space Center (JSC). The technical details concerning my work at JSC will have to wait until they are published on NASA's website in the middle of September, but for now, I would like to catch you up on my time here, and how I am now. My First Week at NASA! Hello and welcome to a rather special and exciting update! I have been granted the opportunity to work as an intern at the Johnson Space Center, NASA's main site for everything to do with human spaceflight! As such, I am proud and happy to be able to write about my time there, so if you're interested, keep reading! I just watched the movie Her, and it has inspired me to think more about the nature of love, intelligence, and consciousness. While I am often inspired to think of these matters, I am rarely inspired enough to write down my thoughts, and even more rarely do I take the opportunity to do so. However, I have the time, and this movie has introduced many interesting ideas which I wish to explore. They say 9 months is how long it takes to develop a human baby. Actually, “they” say it’s closer to 10. Whichever it is, I find it amusing that this chapter of my life, this Masters program and my time in France, lasted roughly the same length of time. This post is entirely reflective, on my thoughts and experiences of the International Space University, and of my time in, mostly, Strasbourg, France. I have had such amazing experiences and I wish to reflect upon them now. All human space exploration, to date, has been designed to return the crew to Earth upon conclusion, but is that the only way to explore space? Mars One has been seeking to answer this question through their proposal to send humans to Mars, one-way, there to live out their lives and settle the Red Planet. Is such a mission plausible? Is it ethical? The premise of one-way missions to Mars was the basis for my team project at the International Space University and one which I’m happy to share with you now. Read on! Hello again, and welcome to another exciting adventure! Today, I'm going to be telling you all about my research into galactic cosmic radiation, and what its existence means for the safety of astronauts. This post discusses the work and findings of my individual project at the ISU, so I hope you learn a lot, and enjoy! My 27th Anniversary of My Birth! Well, this post is about two months late, but it has been a busy two months. Plus, I was relying on others for picture and video and, well, they have been busy too. So, without anymore ado, here is my reflections on the 27th anniversary of my birth! One of the elective courses at the ISU was International Space Negotiations. In an effort to broaden my experience, I took the class, looking forward to reliving my model UN days. The first half of the elective involved a simulated conference, negotiating the terms of a Moon Base treaty. The conference took several days, involving long hours and deliberation, but was one of the best assignments at the ISU! Read on for more details and pictures! Hello hello! This is a very special blog post! So much is happening, and I'm happy to share it with you! Two days ago, my blog hit over 20 000 pageviews! I thought I'd start by reflecting a little on my past, talking about my present, and discussing how I'll be interning for NASA soon. So click that "Read More" or just scroll down as the adventure is about to continue! My last couple of days in Moscow, Russia, were full of sight-seeing, adventures, and dancing! My pictures were from all over the place, so I hope you enjoy! One of the highlights of my Moscow tour was seeing the Cosmonautics Museum! Walking through there was truly like walking through history. I was impressed by the display and by the attention and focus placed on space. So come on! Let's see what Russian space is all about! Continuing our journey through the sites and sounds of Russia, we were fortunate enough to be able to go to Star City, also known as the Yuri Garagin Cosmonaut Training Centre! Here, all cosmonauts, and astronauts, train before going aboard a Soyuz rocket and into space! For the third day on the Russia trip, the ISU students were treated to a tour of the Roscosmos facility, Energia, primary developer and contractor of the Russian human spaceflight program! I was pretty excited to see this place and I think after you see the photos, you'll see why! Day 2 in Russia, when the real adventure began! Waking early the next day, my roommate and I enjoyed a nice breakfast in the hotel lobby. I must say that I love buffets, especially those offered at a resort or hotel. The spread of food is generally really good and the all-you-can-eat aspect is especially welcome. Finishing with full stomachs, we joined the rest of our classmates in the hotel lobby and set off toward the Kremlin and The Red Square! Sometimes, it's good to just get away from it all. With that spirit in mind, I went somewhere entirely different, somewhere I had only really heard of, that being Russia! The following posts will lead you through my adventures in Moscow, Russia, and the many things I saw there. So, let's get going! Have you ever been to a Star Trek convention? Well, until last weekend, neither had I/ edit In an odd turn of events, I found out about a Star Trek convention in Frankfurt, Germany, and quickly organizing myself and a few others, we ended up going where none of us had gone before! A few months ago, during one of the excellent workshops at the ISU, the students had a chance to learn more about the equipment in the Life Sciences lab. Playing around with equipment to measure heart rate, eye movement, and muscle strain, we learned a lot about the human body and measurement methods used both on the ground and in space! All photo and video credit to Adrian Eilingsfeld. In this post, I'd like to delve into the more interesting elements of the Mars Now project and our findings concerning Mars and missions to go there. For an introduction to the Mars Now project, please see this post. These could very well be the first words heard over the airwaves transmitted back from the Red Planet. If it were me, and if I were the second person to land on Mars, my first words would be, "I can see my house from here!" 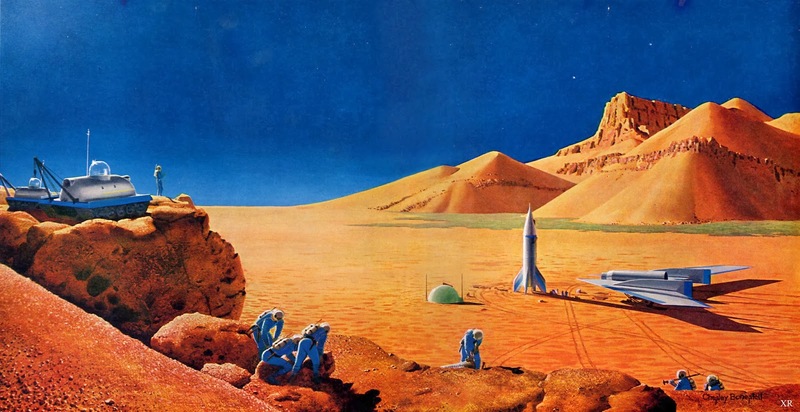 Anyhow, this post is all about Mars, and a team project I'm working on at the ISU involving the possibilities of sending humans to Mars, one way, thereon to settle and build a colony. A lot of work has been done to this point, and I would like to walk you through it!